An iterative process divided into Build, Measure & Learn, where the solution is qualified continuously with potential customers and users. The process model can be used independently by the students as a management tool, or the teacher can decide that the students must go through the Lean Startup phases a specific number of times during the course. Lean Startup is an approach to entrepreneurship. The approach is used in order to reduce risks and the spending of resources during the process, by making sure that the developed solution has customers or users. The model derives from the software development environment around Silicon Valley and is based on a range of principles in order to make the entrepreneurial process more efficient. Lean Startup puts an end to the idea that a product has to be completed before it is brought to market, and the assumption is that as an entrepreneur you need constant dialogue with your costumers in order to create a product that is relevant to them. Lean Startup puts forward a model divided into three phases. This model can be used throughout the entire entrepreneurial process or in specific situations in order to focus on the costumers and accelerate the development. The model is based on validated learning and as such all decisions are based on this, which resembles traditional academic methods that are familiar to the students. Lean Startup consists of three phases that the students repeat in iterations in order to constantly move towards a final solution. 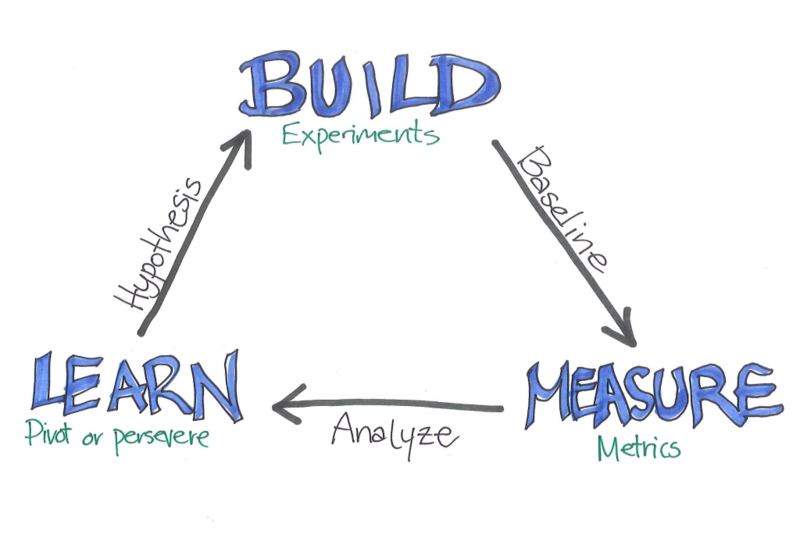 The three phases are: build, measure and learn. In the build-phase the students turn their ideas into prototypes. In the measure-phase the students measure how the costumers will receive the prototypes. In the learn-phase the students analyse their data and find out which conclusions can be drawn as well as which new hypothesis appear. You can read more about each phase below. Under each phase you will also find suggestions on relevant methods to be used in order to support the process design of the specific phase. The Lean Startup model’s phases may be repeated until the product is ready to be launched, or the teacher might decide beforehand that the students have to go through all the different phases a specific number of times. Besides product development in entrepreneurial contexts, Lean Startup is also applicable in case-based courses in which the students have to generate problem solutions to external cases for example. In the same way, this will enable the students to build prototypes of their solutions, test them in relation to the users and improve them based on the collected data. During this phase the students have to develop an understanding of the problem they want to solve and build a “Minimum Viable Product” (MVP) that is to solve the problem. MVP is the minimal edition of a product – or a prototype – which should provide an answer to whether it will solve the user’s or the costumer’s problem and needs. As such the prototype should only just made well enough to provide an answer to the questions that the students have. The students should use this MVP/prototype in order to test their hypotheses in relation to the problem they are in the process of solving. During this phase the students measure how costumers or users respond to their prototype. This is done either quantitatively or qualitatively. The students are to make a test design, which allows them to test their hypotheses in relation to their prototype. It is important that the test design can provide specific and measurable feedback from the customers on their prototype so that the students are able to confirm or reject their hypotheses. In this phase the students gather insights from the measure-phase and use them to test their hypotheses. During this phase the students collect the insights from the measure phase and use them in order to confirm or deny their hypotheses. Afterwards the students need to decide, based on their new knowledge, whether they want to maintain the direction they have for their idea or whether they need to change directions. Then the students need to figure out which questions they now need answers to or which new hypotheses have come up with. As such they have to repeat the build-measure-learn cycle and build a new version of the prototype that allows them to test the new hypotheses.